I hope you're enjoying the good weather. Here in Virginia we had a very chilly week which was a wonderful surprise (although I was concerned about the bird babies with nights in the 50's). We're back to "normal" which is hot in the afternoons. The cool mornings make it okay though. I get to be comfortable outside until about 11 AM and then it's time to close up windows and doors. At night ... it's cool again to sleep with fresh air. Don't you wish you could design your own weather environment around your home? Wouldn't that be fun?! If you looked at a neighborhood from Google Maps' satellite view, it would be very interesting. Yesterday I took a video of a Gray Catbird singing from a bare tree branch. Their song is made up of a long slow series of warbled notes ranging from squeaks to whistles, poorly imitated songs of other birds and the raspy “mew” call, which is how they got the name catbird. A distinguishing characteristic of the gray catbird as opposed to other members of the Mimidae family, such as the mockingbird, is that the catbird does not repeat its song notes. 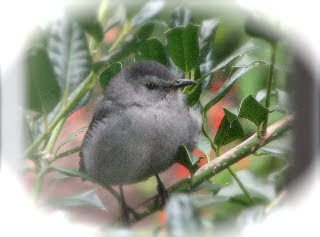 A mockingbird may repeat phrases three to four times, but the Gray Catbird sings most phrases only once. View video of Gray Catbird singing. It's the first one in the album. Last week my neighbor friend and I went to Shenandoah National Park to see Rapidan Camp, which was Pres. Hoover's camp. It was a lovely place that his wife, Lou Henry, designed and landscaped with fountain and ponds. The home was placed where two streams met and flowed into the Rapidan River. I'll have a post about it by the next newsletter, but you can view photos of Pres. Hoover's Shenandoah camp now. If you missed the last newsletter, there were links for photos to many of the places we stopped at on our down to Florida in May. View Newsletter 6/1. Until next time ... make every day a great day!